Love and Other Foreign Words is probably one of the best books to capture that fine line between love and hate when it comes to family. That no matter how much you may fight with them, miscommunicate and frustrate the hell out of each other - you also love each other in equal measure. And that love is just as fierce and strong and necessary to your life even when you want to throttle the other person. I may not have any siblings but I do have a huge family and cousins who I couldn't help but think of as I read this book. Sixteen year old Josie is a genius. Literally, as in her IQ is super high but as a result, she's socially awkward and has a hard time understanding the people around her. She has this funny way of breaking down the way her classmates speak and it's one of the many things that made me laugh out loud as I read. But she does have people she can be herself around - her best friend Stu and her sister Kate. She's close to her whole family (parents, her older sister and her husband) and she has other friends too but Stu and Kate are her people. So when Kate gets engaged to a guy that Josie doesn't even like and we all know how weddings can bring out the crazy.. well, it seems like everything in Josie's life is falling apart and she doesn't know how to fix it. I have this soft spot for socially awkward characters who are endearingly straightforward and honest. AKA characters like Josie. She constantly made me laugh but more than that she made me feel. I felt for her as she tried to figure out how she fit in, as she starting dating someone for the first time and learned how to deal with that and the changes in her own family, especially with Kate. Through all of Josie's rants about how wrong Stu was for Kate and how Kate was changing, it's impossible not to sense just how much she loves her sister. How important she is. Their moments together frustrated me, moved me and brought me to tears. They were undoubtedly my favorite part of the book and if you're looking for a story about sisters, look no further. This is the one you want to read. None! The author captured something really special here and I look forward to reading more from her! I do! My review just scratches the surface of what happens in the book because I really wanted to highlight the family/sister aspect since I loved that part so much. BUT that wasn't all I loved. There's romance and friendship and Josie does a lot of growing up but saying anything more feels spoiler-y. So just trust me when I say READ IT. 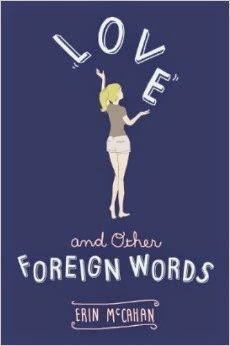 I'm seriously so happy you loved Love and Other Foreign Words as much as I did! It was one of my favorite contemporaries that went under the radar this year, honestly. I loved Josie, and thought that McCahan really brought her to life, quirks and thoughts and all. This book NEEDS more attention!